Synopsis: A young boy sets out to finish his father's project stumbles upon a greater adventure. Javi: So this week, I got the rare chance to go to the theaters twice in this holiday weekend, and of course, I saw the two movies which were definitely targeted towards kids. Of course, the first one was the THE MUPPETS, and now we have the latest non-gangster movie by Martin Scorcese, HUGO. Even though this was an adaptation from the children's book, I had zero context or even clue at what this movie was about. The trailer was confusing to me because it just seemed to be images of sprockets and clocks and kids. Now, to preface the review, I did not see it in 3-D, but I honestly felt nothing was lost. Once again, not knowing much about the movie you're seeing can be a true blessing. Last time this happened to me, it was a good surprise. This time with HUGO, it was an even better surprise. I felt tension, and I kept guessing in a lot of ways of what was going to happen to the characters. HUGO was one of the best cinematic experiences I've had in a while because I left the theater smiling wider than I had even more than THE MUPPETS. This movie much like the key in the poster; it has a lot of heart. Martin Scorcese seemed to have poured a lot of love into this project because of what the movie ultimately becomes, the beginning of movie making, special effects, and the preservation and appreciation of film. The first bit of the plot felt like it was part of a different movie, but after that section was completed, the emotional and visual impact just kept on building up to the climax. The child actor, Asa Butterfield, played a convincing Hugo without overdoing it. He was able to balance his simple and child-like motivations with being endearing and sad. Chloe Grace Moretz was a bit of a weaker aspect of the movie because given everything that transpired, it almost felt like she was more a plot device than an actual person. Yes, she likes books and is related to Georges Méliès, but in the end she adds very little. Now, Ben Kingsley is a man that deserves some more love for this movie. I am rarely moved by actors as I was for his portrayal of Méliès, as thoroughly broken man drifting along. Overall, this is one of the best movies I've seen this year. The love put into this movie, the visuals, the technicality, and everything about it made it as much of a celebration to film as the story. Jonesy: Honestly, I'm not a huge fan of the family movie genre; the stories are all too similar, the characters are usually boring, and they always seem one B-list star away from appearing on Lifetime or as an ABC Family special. 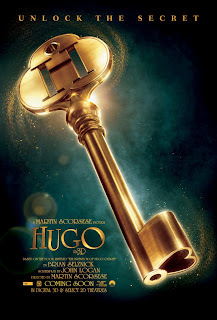 So, I went in to HUGO, as it has been marketed as a family movie, with not a lot of expectations even with Scorcese as the director. All I knew was two kids figuring out a mystery in a train station and something about films and clocks. And oh was I ever put in my place. I was completely enchanted by the whole experience, and I was brought back to the time when I fell in love with movies. Maybe saying this film is a family movie is unfair because that's too easy of a classification. It's a history lesson, discovery of the past, and of oneself. HUGO is such a smart film. It hits all the right notes of a children's adventure movie, yet it sounds odd, but I felt as if I was listening to a story from my great-grandfather. The film has so much heart behind it; the passion and love it took to make it just radiates off the screen. I happen to also see this movie in 3D. Now, I tend to grumble when live action movies are in 3D; however, not since AVATAR has a movie used 3D so well. There were very few instances where the 3D felt intentional like a face coming at you, but rather the 3D enhanced the depths and visuals of the world. I can take or leave the 3D in general, but this is a perfect example of how it should be used to add another layer to live action movies. Sometimes in the midst of big budget hoopla that movie goers are subjected to or the low-budget-drag-you-through-the-mud-of-emotions indie films that come out during this time of year, it is absolutely refreshing to experience a heart-filled, smart, defying cliched film. I don't have any children, but when I do (in the far future), you best bet this is the kind of family film I will be taking them to see...none of this Alvin and Chipmunks garbage. The movie itself runs a bit long at 127 minutes, but Hugo is worth every minute for the visual feast it provides, and features Scorsese in probably his most delightful and elegant mood ever, especially with all of the beautiful 3-D. Good review. Check out mine when you can. I can agree that the length was a little bit off. I think that the fact that the first part of the movie with the automaton felt completely disjointed from the second half of the movie adds a bit to it. I'll definitely be checking out your review Dan, thanks!